Yes it’s autumn. 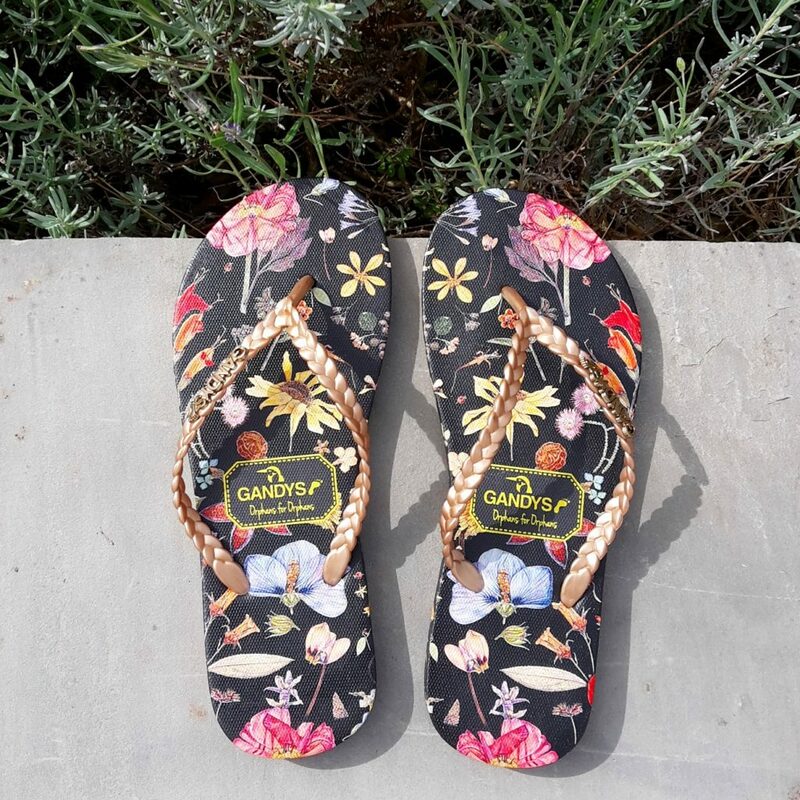 In fact, it’s really very cold for October and it probably seems like a strange time to be talking about flipflops but I couldn’t resist because these are no ordinary flipflops. On our recent Cornish adventures we returned to Fowey one afternoon because it’s one of my favourite places in the county and has some rather lovely interiors shops. We’d walked past Gandys but I hadn’t put two and two together in my head and associated it with the story I’d read about in the papers years before. As soon as we returned and I went inside, I knew why the name seemed familiar to me. Gandys is run by brothers Rob and Paul Forkan who sadly lost their parents in the Boxing Day Tsunami of 2004. The Forkans were in Sri Lanka as part of an incredible and adventurous life-changing decision to learn not by traditional schooling but by seeing the world. All four Forkan children (Rob and Paul have a younger brother and sister) had been travelling with their parents since 2001 when their worlds changed forever. I remember reading about the devastation, seeing the pictures on the news. Nothing prepares you though when you’re so distanced from it. It wasn’t until we visited Sri Lanka in 2014, just one of the countries to be deluged by the tsunami, that the reality of what happened 10 years earlier really hit home. Driving along the tranquil and idyllic Sri Lanka coastline it was almost impossible to imagine what happened but the memorials you see along the way are a very real reminder. But the story doesn’t end there. Determined to remember their parents and honour their passionate zest for life, the brothers founded Gandys from their London bedroom alongside their charitable ‘Gandys Foundation’ which supports the Orphans for Orphans initiative, aiding underprivileged children with education, medication and nutrition. 10% of Gandys profits go towards the initiative and in 2014, 10 years after the devastating event which changed their lives, Rob and Paul opened the first Orphans for Orphans facility in Sri Lanka. A truly remarkable, kind-hearted and awe-inspiring achievement. So there comes a time when factors collide – you’re in need of something, you find the most amazing style or design AND if you buy it’s contributing to a wonderful cause. This is what happened when I stepped inside the Gandys store in Fowey. I had a pair of Havaianas flipflops that I adored but my Mum’s dog demolished when she came to stay in August. 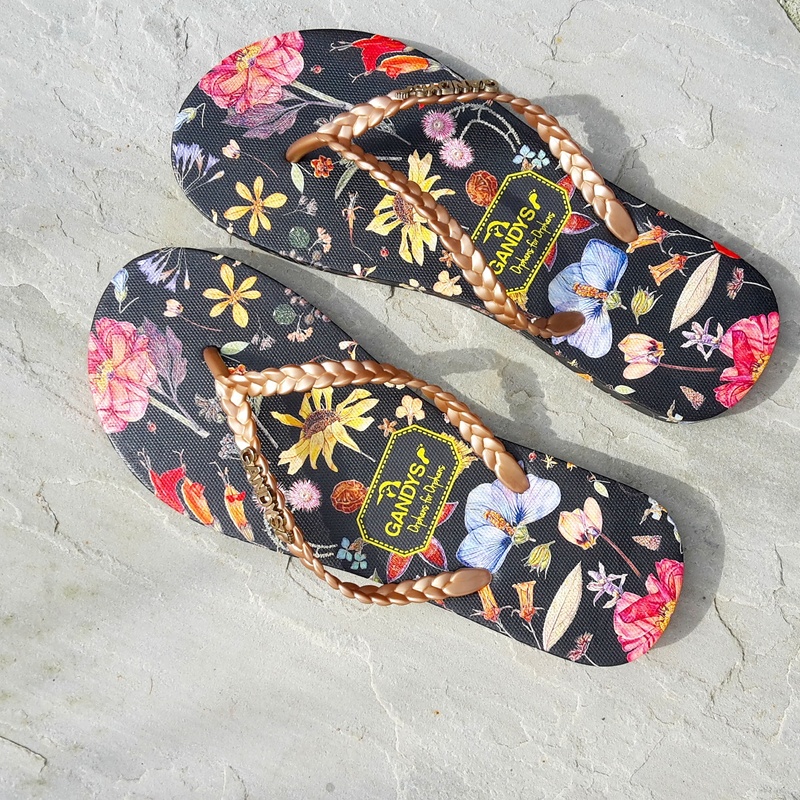 I was on the hunt for a replacement pair but wanted something a little different and unique and knew when this incredible Liberty print popped into view that they were the winning pair. It’s unlikely that they’ll be seeing much outdoor activity until next summer, we have no winter sun holidays planned and it won’t be warm enough. But they do get a lot of wear around the house and are so very comfy. The band across the foot is metallic gold/bronze with the Gandys logo on and I just really love everything about them. Unfortunately I couldn’t find them on their website to link to, but they’ve got some other really stylish designs including a Rolling Stones collaboration which I love as well as clothing and bags. Please do take a look – this isn’t collaborative in any way but just something I wanted to share. As well as their Fowey store, there is also one in London and you can shop online.